By Daniel Horowitz—With more than 100 Hamas rockets being fired into Israel daily from Gaza since the IDF began its Operation Pillar of Defense a week ago, over 2,000 members of Toronto’s Jewish community, and many from the community-at-large, packed Toronto’s Beth Emeth Synagogue on Monday evening, while another 2,000 made their way to one of the three satellite locations set up across the GTA, to demonstrate their support for the people of the Jewish state. 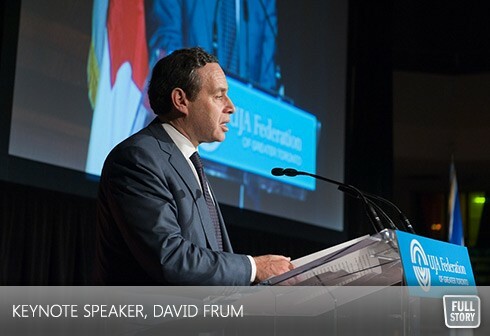 Organized by UJA Federation of Greater Toronto in partnership with its advocacy partner, The Centre for Israel and Jewish Affairs, The Rally for the People of Israel included an inspiring address by Canada’s Minister of Heritage and Language, James Moore, and a keynote address by Toronto native David Frum. “Make no mistake, those who pose a threat to the existence of Israel pose a threat to us all,” Minister Moore told the energetic crowd who responded with standing ovations while waving both Israeli and Canadian flags. “As a free, democratic Canadian community, we stand with our brothers and sisters in Israel and let the world know that until the residents of Israel can lead lives free of danger, fear and anxiety, we cannot lead totally normal lives, either,” Elizabeth Wolfe, Chair, UJA Federation of Greater Toronto, told the crowd. “It’s been said that in times of crisis, we are Israel’s secret weapon, and, as you know, Israel needs our love, our solidarity and our support now, perhaps more than ever.” Since 2007, UJA Federation has played maintained a vital, constant presence in Sderot, the Israeli city that lies less than a mile from Gaza. With its network of agencies on the ground in Sderot, and elsewhere throughout Israel, those victimized by the unrelenting rocket attacks are already receiving humanitarian funds as well as psychological counseling for those suffering from Post-Traumatic Stress disorder, an all too common issue. “Even as the media tallies non-combatant losses, we stand here today in witness of the truth that no country in the history of warfare has done more to protect the civilian population of its enemies from the wars those enemies themselves started,” said Frum. The approximately two-hour rally also included a live Skype broadcast from Tel Aviv where Julia Koschitzky, a respect leader of Toronto’s Jewish community, surrounded by other volunteers from Toronto, spoke briefly. And, the evening was not only witnessed by the 2,000 participants in the shul, as UJA Federation set up three satellite locations across the GTA that attracted more than 1,000 viewers, while more than 1,100 more watched from their home. “What can you say about this amazing community?” marveled Ted Sokolsky, President & CEO, UJA Federation of Greater Toronto.